Moist/Dry Setting: All vacuum sealers can seal dry foods, but not all of them are going to do moist foods. It’s best to pick a product that has both a dry and a moist setting to avoid having to buy two separate machines. Indicator Lights: Are you going to want to be able to see what you’re doing and when you are doing it. Most of the lights just tell you when the machine is sealing, but other machines with more options have different lights. Pieces: What do you want your vacuum sealer to come with? Extra items, bags, a carrying case, etc. This is something to look for if you want a vacuum sealer with all of the bells and whistles. 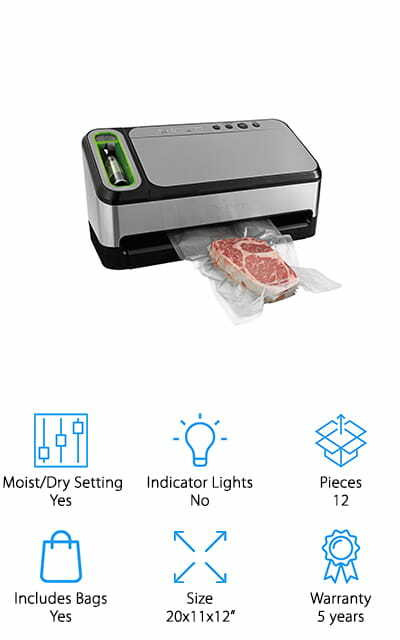 Includes Bags: When you spend a bunch of money on a vacuum sealer for your Sous Vide, the last thing you’re going to want to do is spend a bunch more money on the bags. Opt for a machine that comes with bags instead. Size: Size may matter to you in this instance. Do you want a large machine that takes up a ton of counter space or something a little smaller than you can store when you aren’t using it? Think about your counter space. Warranty: The warranty is a way of the company backing up their product. If anything should happen to it that is out of your control, the company will replace or repair it at no cost. Beware of products with no warranties. We have made it down to the list of the top 10 best vacuum sealer reviews. Each one of these products has their own features and prices. Some of them are better than others, but if you just want the best, scroll to number one, which is the top pick. If you are tight on money, check out our budget pick at number two. Let’s get down to the reviews, shall we? 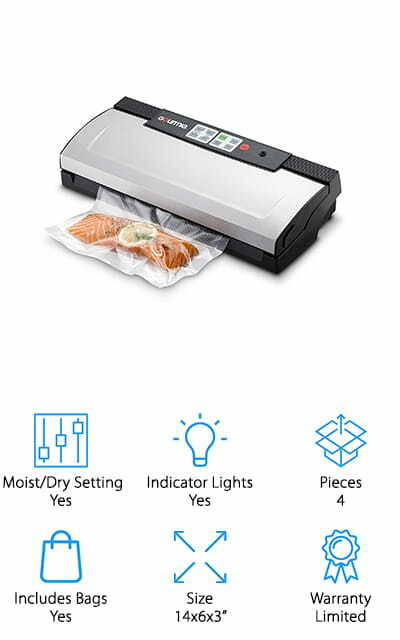 The Foodsaver Vacuum Sealer comes in as our top pick as the best vacuum sealer for sale for a variety of reasons. For starters, this is actually a starter kit which includes an 11”x 10” roll, three qt. heat-seal bags, 2 gallon heat-seal bags, three qt. Zipper bags, and 2 gallon zipper bags as well as the machine itself. There is a built-in retractable handheld sealer that seals zipper bags, canisters, containers, and it can marinate food in minutes. This machine has a moist/dry setting on it for optimal sealing and a convenient roll storage and bag cutter. There’s also a pull-out drip drawer with a removable tray that can be washed in the dishwasher. The Foodsaver also has a fully automatic operation which auto detects Foodsaver bags and starts the vacuum sealing process. This system comes with a 5-year warranty and is engineered to work best with Foodsaver bags and rolls. The NutriChef Air Sealing System comes in as our budget pick due to its low price but it comes with many features. This is an easy-to-operate system that is fully automatic and features soft touch digital buttons and LED indicator lights. There are two sealing modes that you can use based on the type of food that you want to seal which includes moist and dry. The sealer can preserve food up to five times longer than zipper baggies alone. Aside from the actual vacuum sealer and hose, you will get a wine stopper, five medium bags, and one extra long vacuum bag. Each is reusable and waterproof. To ensure that your food is safe from bacteria, you have to clean the product, but it’s easy to clean and stain-resistant. You can choose from silver or black colors, silver being stylish and black being sleek. 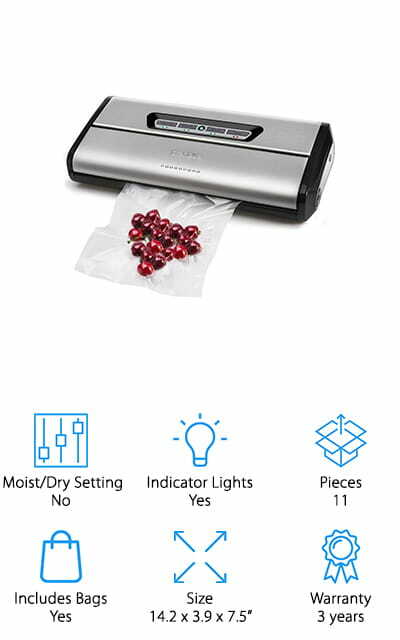 This is definitely one of the best cheap vacuum sealers out there. Sous vide cooking consists of treating and preparing food through partially cooking it and then vacuum sealing and chilling it. 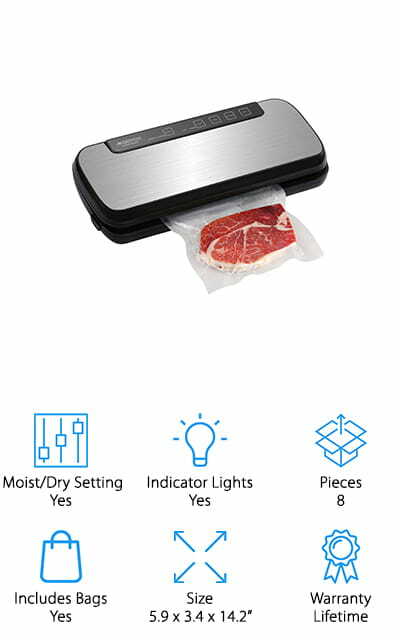 Since this has to have a very tight seal, there’s no doubt that you need a reliable vacuum sealer such as the GERYON Vacuum Sealer. There is a dry and a moist setting on it with on a one touch operation that allows you to simply select what you want. You can also marinade ingredients together to create ready-to-cook meals in a jiffy. The automatic vacuum sealing operation is hands-free and the seal indicator lights give you a heads up as to what your sealer is going. To ensure the best performance and safe food, it is ideal that you clean your product after each use to deter bacteria. With your purchase, you will get the sealer, five vacuum bags, a vacuum roll, vacuum hose, and the user’s manual. This product also has an accessory port feature and is compatible with wine stoppers. The stainless steel Crenova Vacuum Sealing System is different from any other plastic vacuum machines. The stainless steel composition gives the unit long-term use and is easy to clean. The vacuum sealer keeps your goods tight and fresh up to 8x longer than zipper bags. 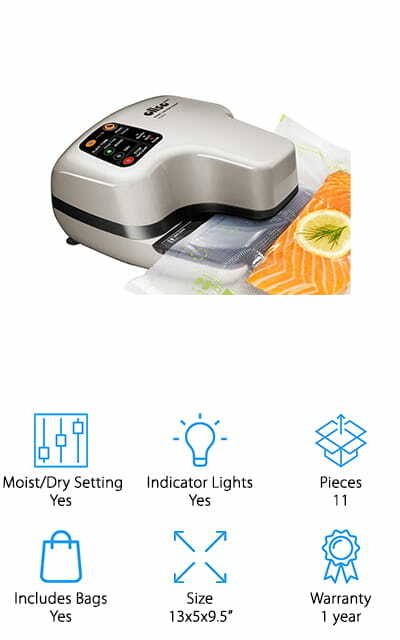 This particular vacuum sealer has a pulse function that is designed for soft and crisp foods such as chips and cakes. The Crenova is an ideal partner for sous vide cooking because the nutrients and trace elements aren’t lost and the veggies will stay crisp and colorful. There is a multi-layer material heat that seals the bags to keep air out and prevent any freezer burn. No more will there be issues with microbes, mold, mildew, or infestation of insects. With the Crenova starter system, you will get five 22x30 bags and five 22x10 bags. The machine is not only good for food items but also household items such as important documents. 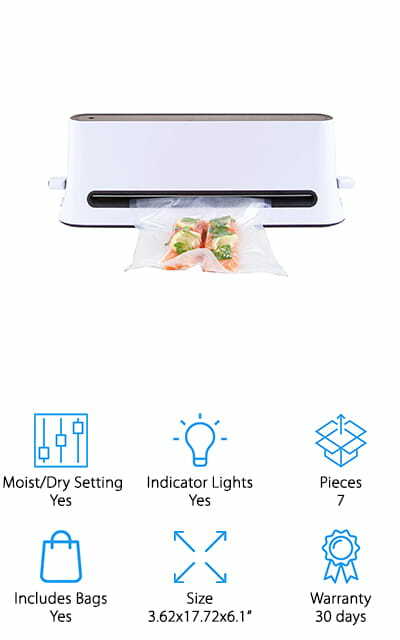 The KOIOS sous vide vacuum sealer is the perfect kitchen companion. It has the ability to preserve food and wine and you can cook food in advance and then vacuum seal it in individual portions or entire meals for consumption later on. You can use the dry or moist feature if you are sealing foods that are dry or moist. This will reduce the oxygen on the bag and pull away any extra moisture. 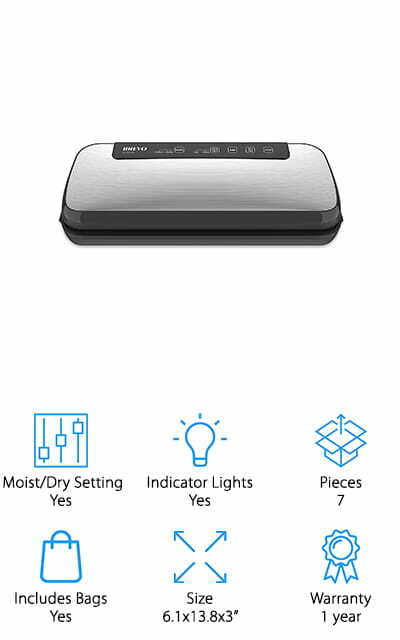 The KOIOS automatic vacuum sealing operation is hands-free and there are seal indicator lights. It offers you a quick and easy inexpensive way to preserve your food. This food sealer comes with an accessory port feature that can preserve food with a vacuum canister and is compatible with wine stoppers. The touch panel on this device allows you to perform every function easily. You can press the three function button to vacuum and seal your food with ease. This machine can also seal and vacuum multiple bags at once. The Gourmia GVS435 Vacuum Sealer is one of the better vacuum sealers for sous vide cooking and here’s why. This particular machine has eight versatile functions. You can vacuum & seal, pulse, manual seal, canister, gentile, moist, normal & dry. There are also handy LED indicator lights that display which function is being used so you can have the best results each time you use it and there’s no guessing involved. There’s also the noise reduction which is an extra low and quiet operation. The compact stainless steel compact design is ideal for even the smallest counters. You don’t have to worry about this particular model being too bulky. It comes with a vacuum roll cutter, a roll of bags, and it is compatible with the vacuum marinator bowl, canister, and wine stoppers. It can be used for a variety of purposes and it can create artisanal dry aged meats. This vacuum sealer is ETL approved and it turns off automatically. 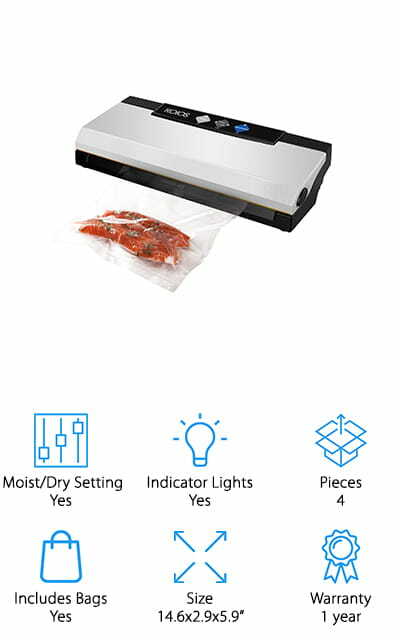 The RAZORRI E5200-M Vacuum Sealer has two vacuum modes. If you want to seal food without crushing it, you can use the gentle mode. This mode is much shorter than the normal mode. You can also choose a dry and a moist mode depending on the food you are trying to seal up. The machine is powerful and can create a suction up to -0.8 bar and eliminate air in a matter of seconds. To operate, just lock the lid in place and press the button, the machine will do the rest. This machine is ideal for those who are fans of sous vide. You can use the sealer to seal your food then cook it with their precision cooker at a preset temperature and time (sold separately). With the purchase of your vacuum sealer, you will get five high-quality starter kit vacuum bags and a vacuum roll so you can operate the vacuum seal right out of the box. This compact commercial-power sealer contains a commercial-power dual motor system for optimal results. It has patented dual-seal freshkeeper technology to give you maximum freshness for your food. This machine also has an automatic start feature that allows you to simply slide the bag under the machine and viola! This machine is said to get more air out of the bag than other machines and it has an easy clean drip tray that catches excess liquid. You can flip flop back and forth between dry and moist modes for optimal performance as well. There is also a stop and seal setting that allows you to stop the vacuum while it is sealing fragile foods. The bags are BPA-free and can be reused, saving you a ton of money in the long run. The kit includes multiple sized bags, the vacuum sealer, a flexi tube, zip disc, and an exclusive bonus of three wine and olive freshkeepers. The BREVO Automatic Vacuum Sealer can keep foods fresher up to five times longer than ordinary storage alone. It is ideal for sous vide cooking as it saves proteins longer. Most users won’t even need to use the instructions when starting the machine. All you do is put the bag on the chamber, lock the lid, and press the vac seal button. You will have results in seconds! You can choose the type of food that you are vacuuming such as dry, moist, normal, and gentle. The gentle mode is for delicate foods and snacks that you don’t want to crush. There are convenient LED lights at the top of the machine that tells you what you are doing for optimal performance. The stainless steel finish will bring a sleek and stylish appearance to your kitchen. With your purchase, you will get five medium bags and one extra large bag roll. 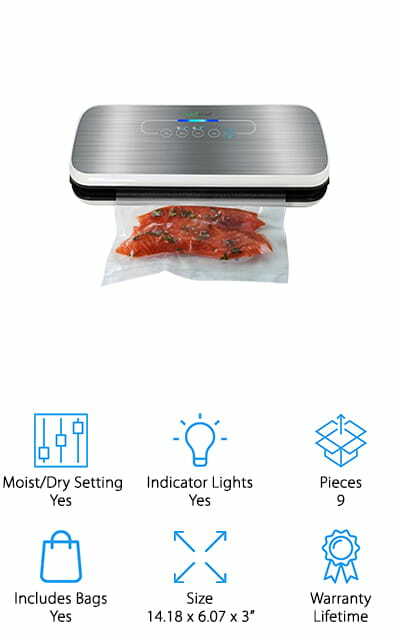 The last sous vide vacuum sealer review on the list is the ICO vacuum sealer. This particular vacuum sealer is smaller than most to save counter space. It’s not bulky and it won’t cause clutter. It has been specialized for sous vide and adventurous cooking. 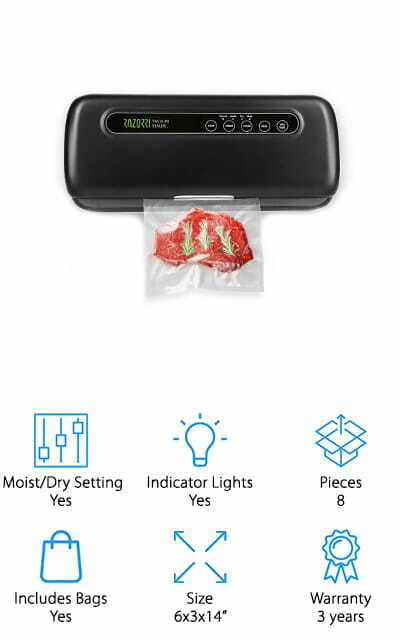 Anything from fish to beef steaks can be placed in this sealer in one of the included bags. It has a patented vertical action pump that gives you the perfect vacuum seal each and every time. It is also easy to operate. You can secure the lock catches one at a time or ever together. So when you have your hands full, it’s still secure. You can choose from four settings such as gentle, normal, moist, and dry. There are separate buttons for seal and vacuum that allows you to seal snack bags without having to vacuum them as well, crushing the snack. The LED”s indicate each function for perfect operation every time.